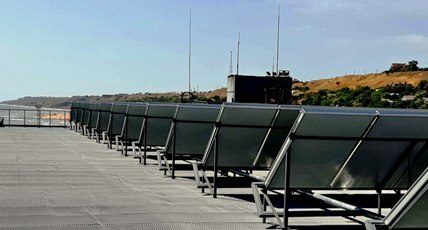 September saw the commissioning of Ukraine’s largest solar thermal system. Its 252 flat plate units add up to 518 m² of gross collector area and supply heat to the showers and kitchens at Mariupol, a major trading port on the Sea of Azov, near the Black Sea. The renovation of the boiler building hasn’t been completed yet, so that the solar installation will only be fully operational next year. All collector parts were manufactured by Ukrainian businesses and delivered under the brand name SintSolar by Sintek, based in Zaporizhzhya in southern Ukraine. “We supplied the main components and provided technical support,” confirmed Alina Sych, Head of the Energy-Saving Technologies department at Sintek. Installation was done by Electromotor, another Ukrainian-based company. The on-roof system has been designed to meet hot water demand during the summer months. “The roof is orientated away from the south at 30° to the west. Calculations had shown that for optimal installation and maximum productivity, the solar collectors needed to be installed at an angle of 35°,” explained Sych. In mid-August, it was reported on http://mrpl.city that the system had cost Ukrainian Hryvnia (UAH) 5 million (USD 188,000). It is expected to save about UAH 1.2 million annually, which would put the payback period at around 4 years. The investor is the publicly owned port.